Global supply chains are complex. Trying to get products to market and keep up with trends is challenging enough for brands and retailers, but imagine for a moment you are a supplier or a factory and you’re dealing with fluctuating purchases and trying to grow your business sustainably. A meaningful shift in human behavior cannot be created through comply or die scenarios. And since many responsible sourcing investments started some years ago, we’ve seen supply chain stakeholders take more short cuts, at the expense of labor and human rights, the environment, intellectual property and even national security. Imagine under these circumstances if you’re that person, that worker – left behind. News flash: if you’re just auditing and having factories meet corrective action deadlines, your program is not creating the impact or reaching levels of effectiveness that your board, stakeholders and customers expect. In time, the compounding effect leave its mark and slow impact and progress. This dilemma is understandable – supply chain compliance or procurement managers today are fighting for a peaceful night’s sleep not just for themselves but for all stakeholders in the supply chain. There is a war being waged between the angel and the devil on their shoulders. On the one hand, the pressure is to continue to do business as normal and audit till kingdom come. And comply or die. And feign responsibility for real impact and improvement. But that other side is pulling you towards doing things differently, you feel that sense of responsibility, you hear the angelic whisper of words seldom used-and-followed-through-with in the compliance driven model. Words like “trust”, “partnership”, “loyalty”, “reward”, “education”, “equal partnership” – all elements of an atypical supply chain compliance program today. The devil on your shoulder may nag at you that it’s too expensive and can’t be done reasonably. We challenge you to ignore that voice and join the ELEVATE webinar to follow a different path. 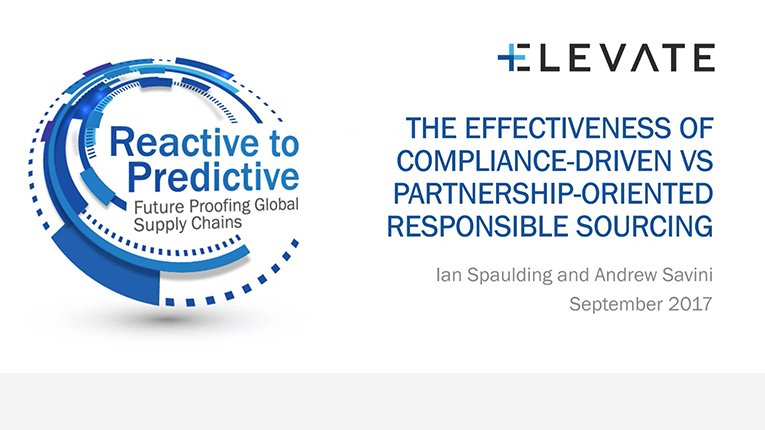 You’ll learn a variety of strategies and tactics that will make your compliance program more supplier-centric and effective. Curating our collective wisdom at ELEVATE, CEO Ian Spaulding and Director Andrew Savini will share success stories, analytics and solutions from our work with leading companies. Choose the right path, adopt a partnership approach, empower your program and influence your supply chain.